Looking for some inspiration for your next training session? 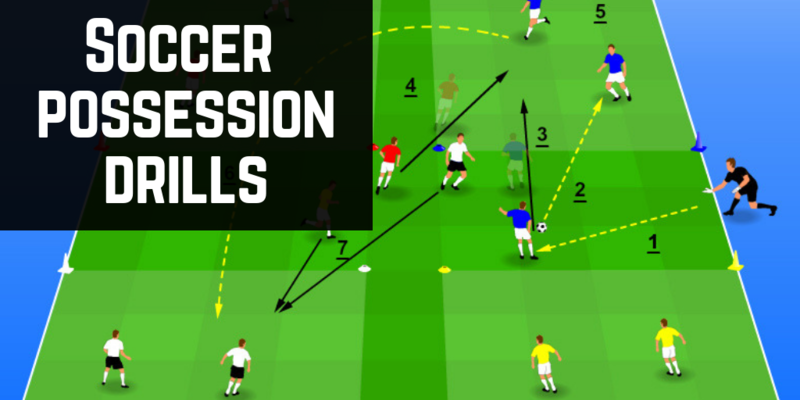 Have no fear, because in this edition of Simple Soccer Drills we have 5 great soccer possession drills that span across multiple age groups and abilities. We’d always recommend taking the ideas from each and creating your very own, unique adaptation of the drills…and make sure to document them down in your training session portfolio. Finally, you’ll need some basic equipment to keep the session organized and as easy as possible for your players to understand what you’re trying to get them to do. Go from unorganized, jumbled notes to a clean and easy-to-read porfolio of soccer training plans. 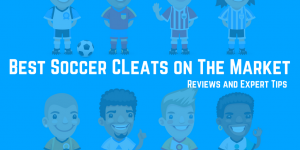 You can now download the FREE PDF companion guide to this very blog post and you'll also get access to every other training guide we have onsite including; Defending, 1v1's and Overloads to help you take your players, your trainin session and your coaching to the next level. Simply enter your name and email address and I'll have the guide over to you in the next 30 seconds! The goal of this drill is to improve a player’s ability to make decisions and to avoid getting caught with the ball. The game is structured in a predesignated grid with 4 players working simultaneously with two balls in play at all times. Three players are designated as attackers and one is a defender. The role of the attackers is to continuously move the ball between the three of them and complete as many passes as possible while staying within the designated play area. A goal is scored for every 10 completed passes. The role of the defender is to intercept one of the balls. 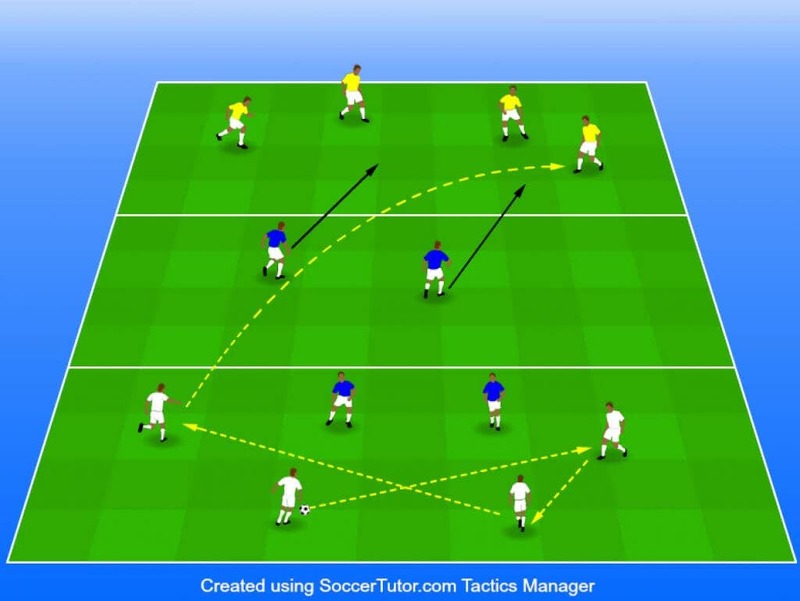 When a defender successfully captures a ball, they switch roles with the attacker and now work with the other two players to complete passes while the new defender tries to disrupt the play. The attacker who does not have the ball must work to find the correct angle and depth to receive the next pass. The greater the space, the more time players have with the ball. The better the angle, the easier it will be for an attacking player to receive the ball. This game is designed to encourage intelligent movement from both offensive and defensive players. It is played between two teams of six in a predetermined grid pattern. The field of play is first divided in half lengthwise and then each side is partitioned into four equal squares, totaling eight individual zones. Six players are positioned on each side, consisting of two attackers from one team and four defenders from the opposing team. The attackers are allowed to move freely across their side, while the defenders each stay in one of the four determined zones on that side. The goal of the offensive players is to continuously move about the field of play on their side in order to correctly position themselves to receive a pass. 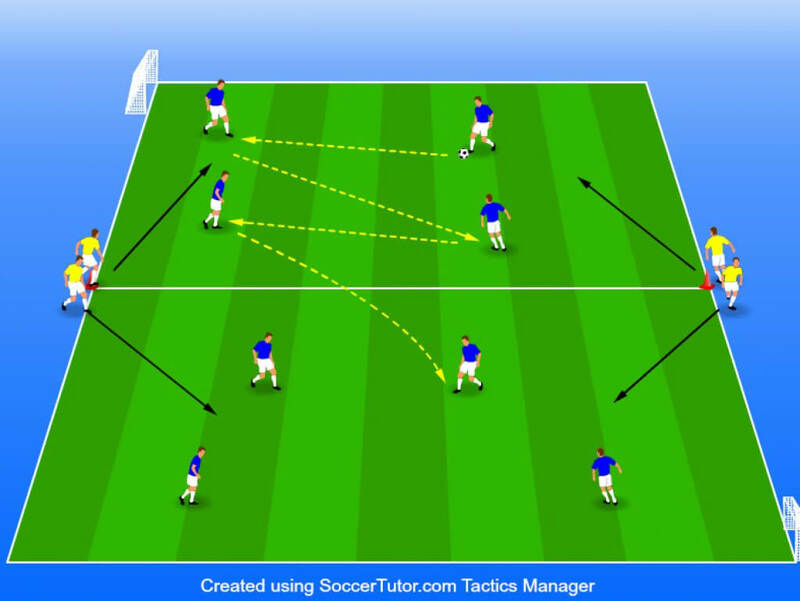 This continuous movement will create increased passing opportunities. Defensive players must work to both capture the ball and accurately pass it to their offensive players. They must likewise react quickly should an offensive player from the opposing team receive the ball. A goal is scored when the defense accurately passes the ball to one of their offensive players who is then able to pass it successfully to their other offensive teammate. 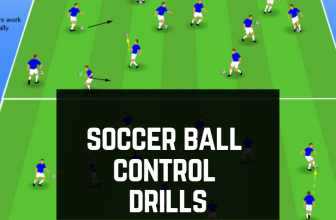 The goal of this game is to encourage quick movement of the ball with increasing accuracy. It is a 5 vs. 3 possession game with five players attempting to move the ball as frequently as possible against three defenders. The game is played on an 18 x 18 field. 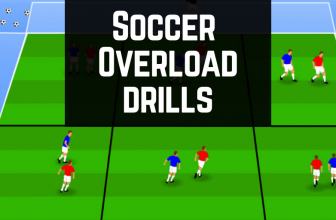 The overall goal of the defenders in this game is to put constant pressure on the ball as much as possible. This forces offensive players to react quickly and limits the amount of time players have with the ball. Offensive players must work to create passing opportunities in a variety of ways. They must be mindful of their surroundings as the field is not overly large and the overall tempo of the game is fast. Staying spread out from opposing players and teammates helps to create supporting angles to receive a pass from the player in possession. 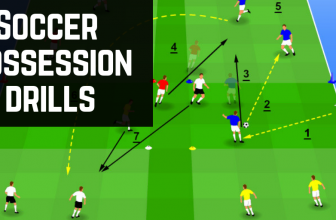 Players are also encourages to try limiting themselves to two touches and keeping passes on the ground in order to improve the accuracy of each attempt. 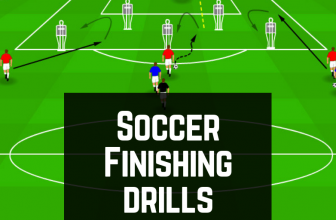 This small-sided game is designed to be used in four on four drills. The area of play only utilized the middle third of a regular field with goals positioned on either end. The objective of this game is for teams to score goals but only when pressure is applied by two or more offensive players. Players are not designated to play in only certain areas of the field and are instead encouraged to move about in order to utilize the total area of play. 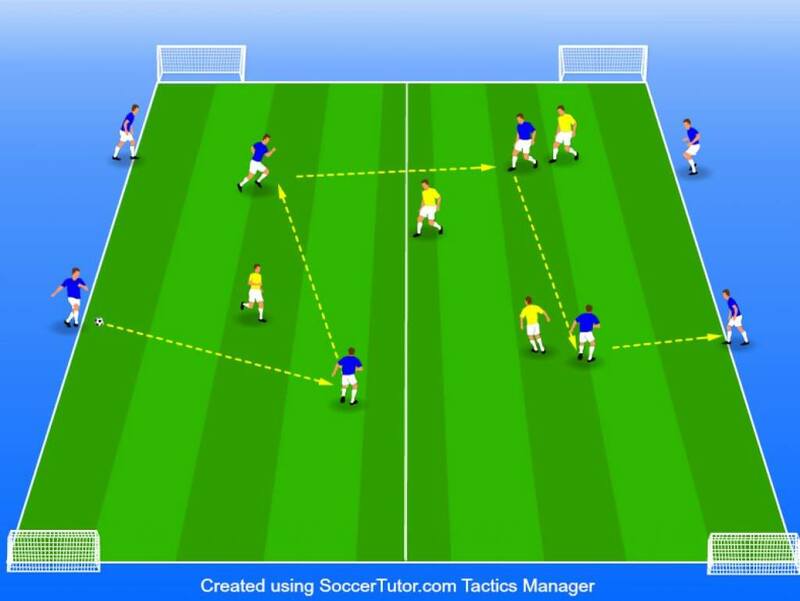 The quick nature of this small-sided game allows for players to practice quick pass combinations as well as timed runs. A team may only score if the ball is passed from one player to another while applying pressure to a defensive player. Goals scored solely by receiving players without a numbers advantage are not counted. Each player is encouraged to push their depth of play and to make use of the entire field of play. Given that this game is played on a limited field, decisions must be made quickly before defending teams can capitalize and intercept the ball. Split your training area into 3 sections. Split your group into 3 teams and place each team in a section. The middle section player will act as defenders, while the outside sections will be the attacking team in possession. The aim is to pass the ball to every member of your team without losing ball. Once every player has touched the ball, they send the ball right over to the other side. The middle section send two players at a time to try and win the ball. If the defenders do win the ball, they swap roles with the team they won the ball from. The team who lost possession now become the new defenders while the original defending team become the new attacking team. For this setup two teams of 4 players. In the center, use 3 slalom poles and position them in a triangle making sure each open side is the same distance apart. Finally place the goalkeeper between the poles. The aim of the drill is for the two teams to play against each other, keeping possession and getting a shot on ‘goal’. The goalkeeper must stay aware to which side the ball is on and react in time to the play. Setup for areas in each corner of the pitch. Place 1 player in each box. These will be your neutral players. In the middle, have two teams of 5 outfield players and finally finish off with a goalkeeper for each team. 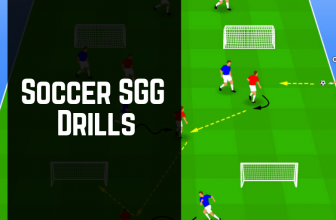 The drill is a normal game of soccer with each neutral player, taking the side of whatever team has just passed the ball to them. So for example, if blues pass the ball out to one of the neutral players, that neutral player becomes the 7th player for blue while they are in possession. The neutral players role resets once possession is lost. Line up 4 defenders either side of the pitch (Yellow). 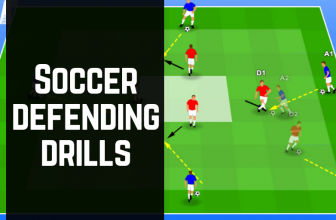 Defenders start the drill by passing the ball into the attackers. 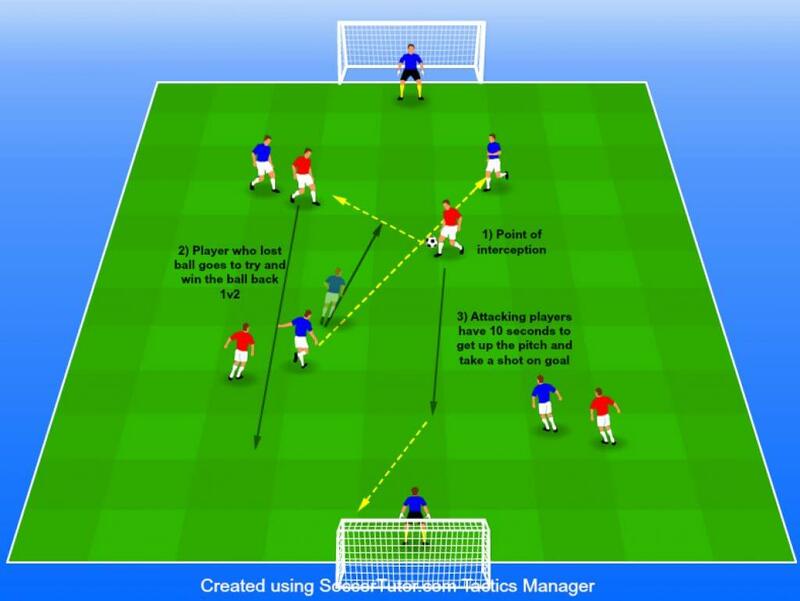 The attackers must make 3 passes before sending the ball over to the other side. As soon as the defenders make the pass or the ball is played to the other side they pressure the attackers to try and win the ball. If they win the ball they are then allowed to aim for either goal. A small boxed off area in the middle: This is where reds will play a 4v2. If the blue players in the middle win the ball they can play the ball to the players on the outside and the game transitions to a 6v4. If the reds win the ball back they can take the ball back into their area to play a 4v2 again. This is a essentially a small sided conditioned game. Both teams play a normal small 5 a-sdie game with the emphasis on keeping possession of the ball. If a team loses possession, the player that lost the ball must now play a 1v2 situation against the opposing team. The attacking team must get a shot on goal within 10 seconds of winning the ball before the game returns to normal. Two teams play a small sided game. The blue team have additional players on the outside to help them keep possession of the ball. The players on the outside are allowed to move up and down the line without being tackled. Outside players are restricted to two touches. If red team win the ball they are allowed to score. Setup: You’ll need at least an 18 yard box equivalent of space available to get this drill going. Setup 1 large squared space, then 4 smaller squares in each corner. Split your group into 4 teams (4 teams of 3 works best) and position 2 players from each team in their box. The final player from the teams goes into the middle + area. The aim of the game is for whatever team is in possession to make 5 successful passes without being tackled to win a point. 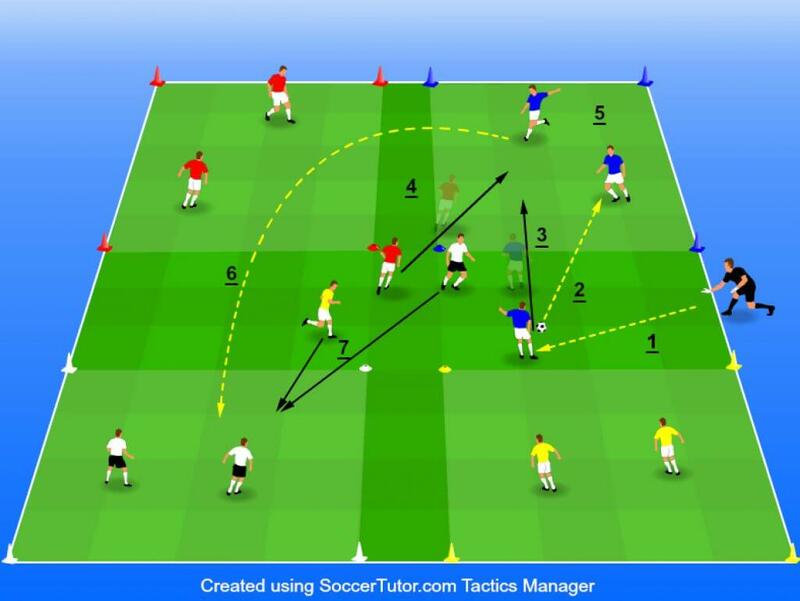 The game starts with the coach rolling the ball into the middle area, the player who wins the ball first passes it back to their team and follows their pass. This team now becomes the attacking team and must make 5 passes before releasing the ball to win a point. The colored team from the RIGHT hand side send their middle player in to win the ball. If the attacking team makes 6 passes they play the ball out to one of the other two teams. If the defender wins the ball they play the ball back to their own team to win 2 points; the 1 point for the 6 complete passes and a point for the steal. A final note for this drill – it can be quite a complicated one. Break steps down and once your players really understand it’ll flow like clockwork. The blue team are trying to pass and move to get the ball to the other side. For every successful transition of the ball over to the other side the blue team get a point. Who ever makes the final pass to the outside swaps roles with the outside player coming in and the inside player going out. This can be great drill to not only work on keeping possession but also to help players understand the game in different directions. Remember to make sure all players play in both directions.